Hydraulic raise and lower of end section, this is homemade, apart from the pipework it is quite tidy. Mechanically this machine has not done a lot of work and is in good straight order, web rollers look good and everything works. Cosmetically very tidy, the paintwork might not be quite as good as the pictures show as it is a little dull but generally very straight. One small dent in the one guard. 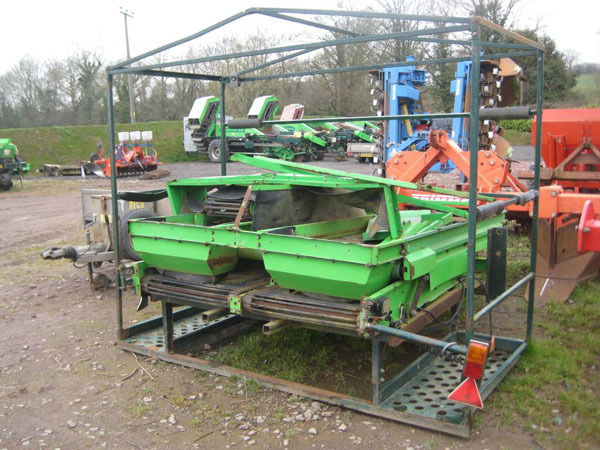 This is a nice straight harvester, paintwork typical Reekie, a bit rusty and faded but no dents or scrapes. Mechanically not bad at all, the web rollers go round, not too much play in Cleanflow Bearing and everything works. Please contact Webmaster if you have any problems with this web site.